Hallo, meine Lieben! You won’t believe it! After so many years of sewing, I’ve finally made my first (wearable) pair of trousers! (Not counting any shorts I’ve made.) Traumatised by hundreds of very unhappy experiences shopping for well-fitting trousers I decided at some point that sewing trousers was very difficult and frustrating and certainly nothing I wanted to try. 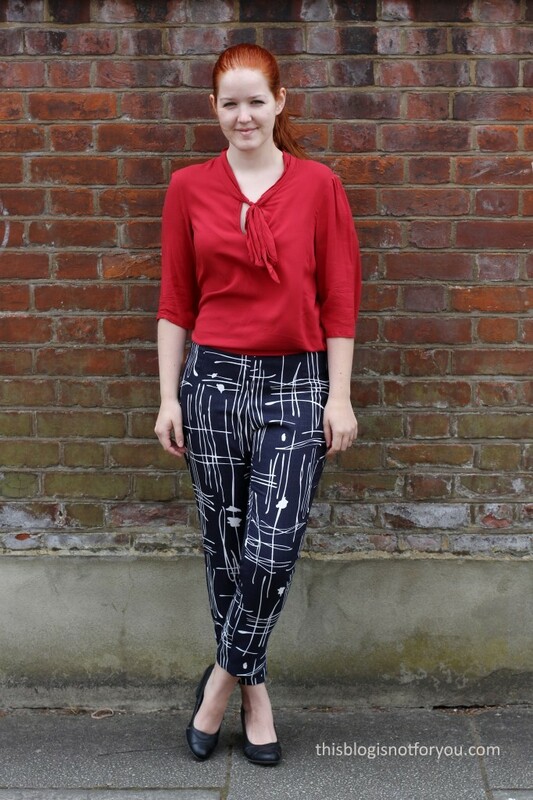 After testing one of their patterns, Lisa from Sew Over It kindly send me her Ultimate Trousers pattern which promised to be a super easy sew, so it went on my to-sew list. About a year later, I’ve finally given it a try and even went as far as making a muslin (a step which I happily skip more often than not). The muslin was a bit meh and I made a couple of very simple changes here and there and suddenly I ended up with some lovely trousers that actually fit me. Who would have known. 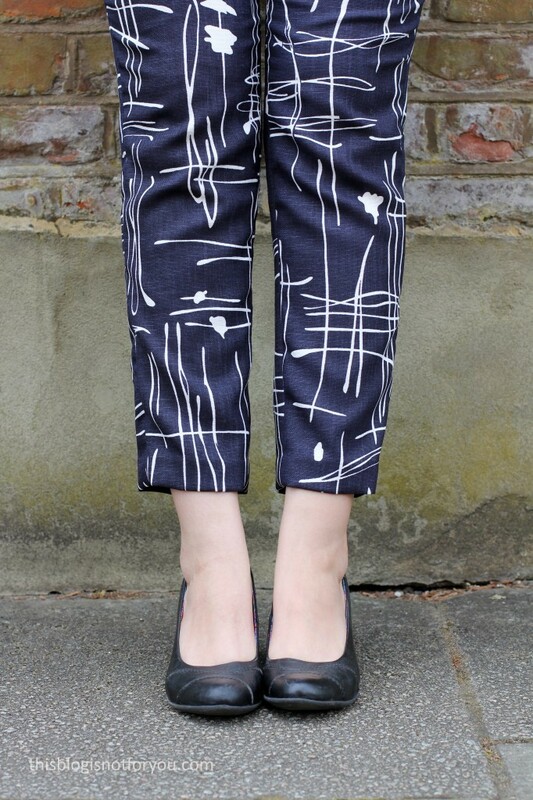 As mentioned, I used the Ultimate Trousers pattern by Sew Over It, which is available as PDF(£8.50) or paper pattern (£14). I think it’s well worth the money, as it’s a simple, classic cut that it very easy to fit and which could be used as a base if you want to draft something more complicated. 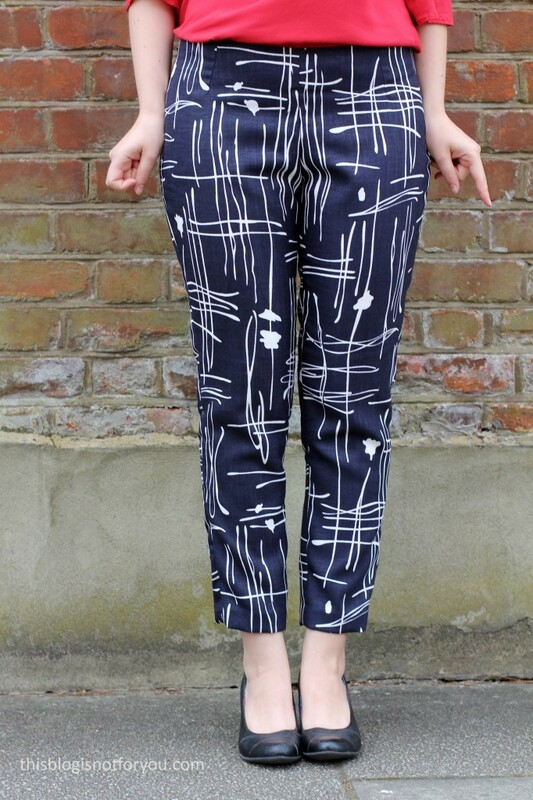 I’ve got a feeling that this will be my TNT trousers pattern for many more projects to come. The pattern comes with detailed and illustrated instructions and it only took me a couple of hours from start to finish. There are no complicated front fly or pocket techniques to tackle, just a very simple invisible zip that’s inserted in one of the side seams. There’s no waist band, but facing instead. I didn’t make any major changes to the pattern, just some tweaks here and there to adjust the fit. The fit was almost spot on, I just had to grade my size up a bit at the hip as I couldn’t close the zip on my muslin. This was quite a simple and quick fix and I didn’t even bother to make another muslin. With all the grading this pair of trousers is probably something between size 12 and 14, I guess. At first the trousers were a tad tight, but I knew that they would widen a bit after a couple of wears (which they did, yay! ), so I didn’t make any further changes. Would I make any more changes next time? Hm, maybe, maybe not. I’m pretty happy with the result. I think depending on the fabric, I might give a bit more wearing ease next time. And should I be super motivated, I might try a sway back adjustment. But that’s not very likely to happen. I wonder why I ended up with a puckering zip? Maybe I should try clipping the seam allowance at the hip curve. Could also be my inability of accurately inserting a zip when having had too much coffee. I actually bought the fabric at Lisa’s new Sew Over It sewing cafe in Islington. I found it in the remnants box and it turned out that it was some fabric that Lisa had used for her own pair of Ultimate Trousers. There was just enough left to make another pair. To be honest, I have no idea what kind of fabric this is, almost looks like linen, but I’m pretty sure there’s polyester involved here. It’s lovely to wear and was easy to sew. It frayed quite a bit, but nothing that my little overlord couldn’t fix. Sooo. Let’s talk about pattern placement. Or, what happens if you completely ignore it. I thought the pattern was random enough but now I ended up having awkward crotch stripes that could even be interpreted as scratches or hair, if you’re adventurous enough. What can I do about that now? I try to ignore it and hope others do, too. I’m pretty positive that I will. I’m just too happy about finally having a go-to trouser pattern, so I’ll better make use of it. So, what are your thoughts on trouser-making, trouser-making phobia and crotch stripes? Wow! Love the pattern love the fabric, love the fit! Great work! I love these! I have been intimidated by pants/trousers, too. It’s one of my goals to conquer them this year. Maybe this pattern will be the one that gets me there?! Oh, that’ll be cool! For some reason I also mostly make dresses, skirts and tops although I used to wear trousers pretty much all the time. Now that I finally conquered that fear of making trousers I’ll probably make a few more! These look great! 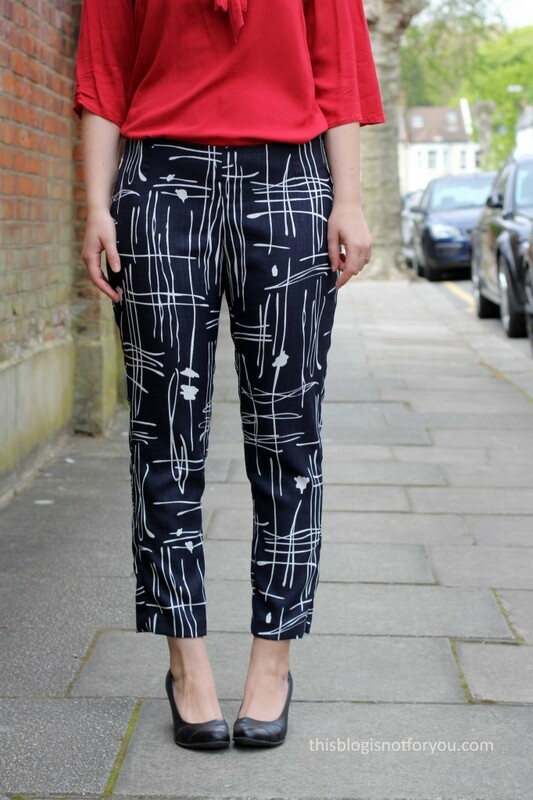 I am currently making these trousers – my first trousers too. So far, so good, but I don’t think they are looking as good as your do. I will keep trying though!!! And I think your pattern placement looks fine tbh, nothing untoward there! Funky! You’ve got a really good fit there. I’m in the middle of trying yo get a classic work trouser pattern sorted and it’s taking some doing! I want a casual pair too though. Love your fabric. Yes, I’m thinking the same as most of the other commenters… people aren’t going to notice unless you tell them….. or they sit and stare! And if that happens, well seems to me you have permission to go slap them silly! Lol…. no one knows but you and well….. all of us readers and we won’t tell! They look great! Just seen your lovely blog posts and photos. The trousers are great, and until you mentioned it, I didn’t notice any funny business with the stripes! About the tiny bit of puckering at the zip, I was wondering whether you had ironed a strip of Vilene to each seam, before inserting the zip? I find it helps stabilise the fabric and makes the zip insertion lie smooth especially when the zip is going onto a curve! Just my thought on it, it might help! That’s a good tip, will try next time! 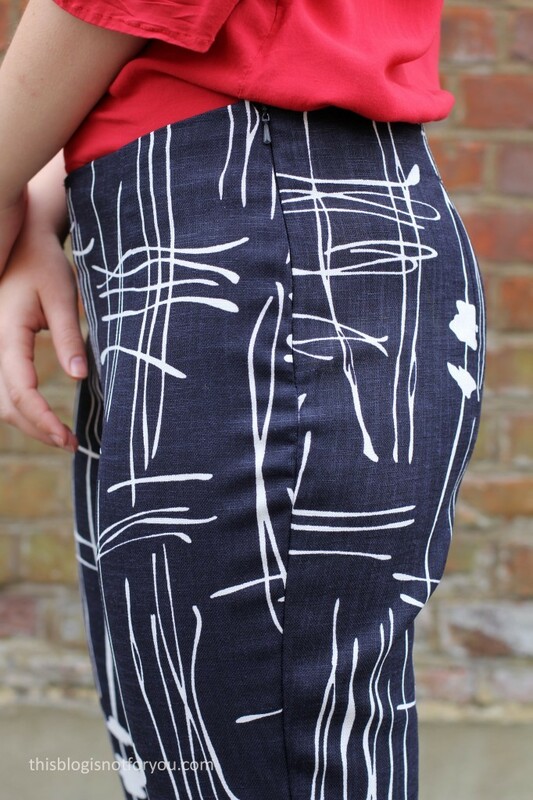 I absolutely love the fabric you’ve used – they look amazing! It’s great to hear that they’re a fairly straightforward sew as I’ve always feared toruser making. Just bought the Sewing Indie Month pattern bundle mainly because the Ultimate Trousers pattern is in there, and I’m itching to give it a go now.